Jessica Klee has been involved in the Entertainment industry for 30+ years. She has been running JLK Productions recording studios in Hopewell Junction NY, since 2006 and is also a FOH (or live sound) engineer and audio tech at Daryl's House Club in Pawling NY. Additionally, she does freelance work as a Digital Producer / Video Editor and A2 Audio tech at Fox News in NYC. She has worked with numerous celebrities including James Earl Jones, John Vogerty, Alice, Cooper, Blue Oyster Cult, Jimmy Vaughan and the Tilt A Whirl Band, The Verve Pipe, Joan Osborne, Kim Wilson and the Fabulous Thunderbird's, Cracker and many more. A player and entertainer for many years, gives her the ability to tap into what her clients are really looking to get out of their experience at JLK Productions. As a Producer and Engineer, she really understands how important it is to "catch the feel" during your recording session. "We want to capture the groove and feel of your performance, while you are in "The Zone" and that is exact what we accomplish". Jessica has been educated at Canada's legendary and coveted, Harris Institute For The Arts, where all Canada's talented producers, engineers and management come from. She has been providing her producing and engineering experience to many artist at her JLK Productions recording studio facility, since she opened the doors in 2005 and has released many LP's, EP's and singles over the years. 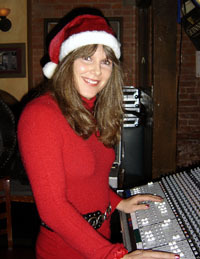 She has also engineered FOH (front of house) at many live venues since the 90's, and has also provided professional remote (on location) recording at many of these live venues. Her experiences and acquired expertise in many different genre's of the music industry, makes her a very well rounded producer & engineer. The RIAA has recognized Jessica as an ISRC Studio Manager, authorizing her to issue and manage your International Standard Recording Codes,directly from the studio. For those not familiar with ISRC's, think of it as a unique SSN for each of your masters (songs, composition, music video, spoken word or any other audio recording). This will closed the link to between you and your music anywhere in the world, by providing information about you, where the song was recorded, your release date and much more, right in the meta-data assigned to your code and printed on your CD. She also brings to the table her knowledge and experience in every aspect of releasing your music, if this is your first release. She is affiliated with ASCAP and Sound Exchange and has her own publishing company Mercy's Madhouse. Jessica has also received certification for stringed instrument repair and building from The Timberline School Of Luthiery. 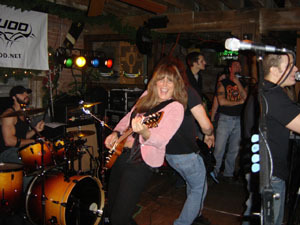 She has worked for many established guitar repair companies in Toronto, Ontario, Canada and ran her own successful guitar repair company " Larz Guitarz", for over 5 years. Most problems with your stringed instrument can likely be remedied right here in our small shop behind the studio. Although we are limited to only minor repairs and set up jobs at the moment, we are planning for a large, fully equipped shop built beside the studio. 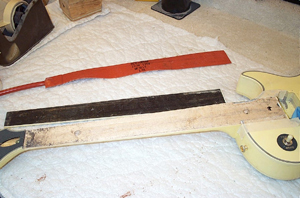 This will facilitate taking on major instrument repairs, as well as, refinishing jobs. 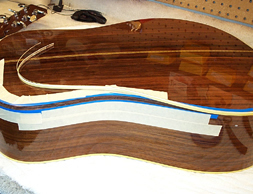 Our Luthier's workstation is specially designed for fret dressing and crowning, as well as, fret and/or fingerboard replacement and other major tasks. (c) 2013 JLK Productions and JLK Professional Services LLC. All rights reserved. Webmaster: Jessica Klee JLK Productions.